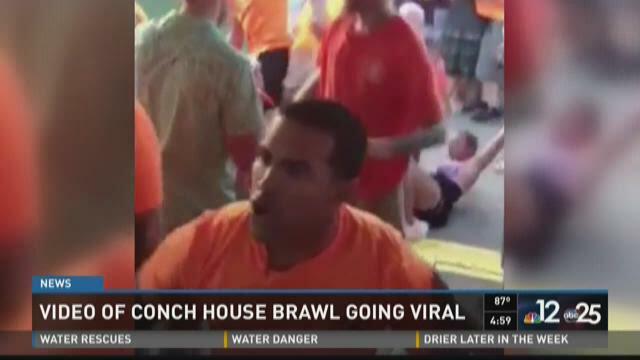 ST. AUGUSTINE, Fla. -- Two men have been charged and two others could face charges in connection to a massive brawl caught on camera last May at the Conch House Marina Resort in St. Augustine, authorities said Wednesday. Adam James Frez has been charged with three counts of misdemeanor battery and Michael McClendon has been charged with one count of misdemeanor battery in connection to the incident, a 7th Circuit State Attorney's Office spokesperson told First Coast News. Prosecutors have not yet identified the two other men under investigation. The brawl happened during its popular Reggae Sundays event last May. The melee, which went viral on social media, led the bar to briefly cancel Reggae Sundays. It involved as many as 500 people, though police did not record an exact count. One person was taken to the hospital and several others received minor injuries following the incident. Customized radar focused in on St. Augustine.